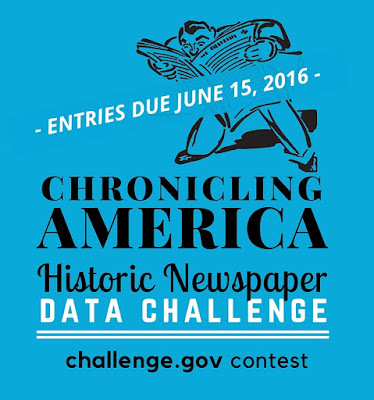 UpFront with NGS: Chronicling America Data Challenge -- Prizes will be awarded! Chronicling America Data Challenge -- Prizes will be awarded! We often talk about Chronicling America as a great resource for digitized newspaper content. NEH has issued a challenge (with prizes!) -- Create a web-based tool, data visualization, or other creative use of the information found in the Chronicling America historic newspaper database. Here’s a snippet about this challenge. ... What are we looking for? NEH encourages contestants to develop data visualizations, web-based tools, or other innovative and interesting web-based projects using the open data found in Chronicling America. There are over ten million pages of digitized newspapers in Chronicling America, published between 1836 and 1922, from towns and cities across the United States. The newspapers illuminate 19th- and 20th-century American life, with stories about politics, sports, shopping, music, food, health, science, movies, and everything in between. Entries should uncover trends, display insights, explore a theme, or tell a story. Understanding historical context always benefits our family history research. What neat project, based on Chronicling America, would you like to see undertaken?